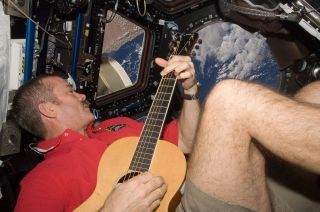 Chris Hadfield plays guitar while floating inside the Cupola on the International Space Station in 2012. Now, songs that he recorded using that guitar are being released on a new album. Chris Hadfield is a Canadian astronaut who is best remembered for his last five-month trip to space in 2012-2013. The veteran space-flier not only commanded the International Space Station, but also charmed the world with his social media posts and humorous videos about life on the orbiting complex. He came back to Earth world famous and in quick succession, published two popular books: "An Astronaut's Guide To Life On Earth" (Back Bay Books, 2015) and "You Are Here: Around The World In 92 Minutes" (Little, Brown, 2014). His skills also extend to playing the guitar, which he did on two space station missions. Aside from his public charm, Hadfield was praised for running a tight ship during his mission — which included repairing an ammonia leak just days before landing. Canadian Space Agency astronaut Chris Hadfield, Expedition 34 flight engineer, watches a water bubble float freely between him and the camera, showing his image refracted, in the Unity node of the International Space Station. Image released Jan. 21, 2013. Hadfield grew up in a country without a space program, in a small town (Sarnia, Ontario). In the late 1960s, while the Americans and the Russians battled in a high-profile space race, Canada didn't have an astronaut at all. Hadfield grew up excited by these exploits and also by the science-fiction movie "2001: A Space Odyssey." But there was one seminal moment that changed his life. "On July 20, 1969, like so many other people, I sat and looked at a bad, grainy little television and watched those first steps on the moon," Chris Hadfield recalled in a 2012 pre-flight interview with NASA. "[I] then went outside with my family, but really alone, looked up at the moon and thought, 'That's what I want to do when I grow up; I'm going to grow up to be something, why don't I grow up to be that.' "
As Hadfield recounted in "Astronaut's Guide," he then shaped his life by deciding to do things that interested him, but also could (if he was lucky) lead him to becoming an astronaut. He joined a Canadian quasi-military program called Air Cadets and while learning leadership and self-discipline skills, he also learned to fly airplanes by the time he was 16. Hadfield knew his chances of being an astronaut were slim, so he focused on piloting as a career. He studied at what is now called the Royal Military College of Canada and picked up a master's degree. In his military career, he flew the then brand-new Canadian CF-18 (a version of the F-18) for NORAD (North American Aerospace Defense Command). He also did an exchange with the U.S. Air Force Test Pilot School. Hadfield was barely out of school when in 1983, the first Canadian astronauts were selected through Canada's National Research Council. Marc Garneau became the first Canadian to fly in space in 1984. Fortunately for Hadfield, he was already well into his career when the new Canadian Space Agency recruited for astronauts again in 1992. He and three other people beat out the odds and were selected from 5,330 applicants. Canadian astronaut Chris Hadfield conducts a spacewalk during the STS-100 space shuttle mission in April 2001. The first Canadian astronauts in space were payload specialists assigned to specific tasks on the space shuttle. Shortly after Hadfield was selected, however, he and Garneau were invited to NASA's Johnson Space Center to undergo mission specialist training to become a crew member with more responsibilities and the chance to take on interesting tasks such as spacewalks or work with the Canadarm (Canada's robotic arm). Hadfield's first flight, in November 1995, took him to the Russian Mir space station as part of mission STS-74. He was the only Canadian aboard Mir and the first Canadian to use Canadarm in orbit. His second flight, in April 2001, took him to the International Space Station as part of STS-100. Hadfield was the first Canadian to perform spacewalks; he installed the new Canadarm2 on station. He did two spacewalks for more than 14 hours "outside." His ground responsibilities were similarly extensive. Early in his career, according to the Canadian Space Agency, he helped create the shuttle's new "glass cockpit." He also was NASA's chief CapCom (communicator with the space shuttle) for 25 missions. Hadfield's other responsibilities included chief astronaut for the Canadian Space Agency (1996-2000), director of operations for NASA at Russia's cosmonaut training center (2001-03), chief of robotics for the NASA astronaut office (2003-06), and chief of International Space Station operations (2006-2008). Hadfield was also getting to know much about long-duration spaceflight, as he backed up fellow Canadian Bob Thirsk for the latter's half-year in space as part of Expedition 20/21. Hadfield was assigned to Expedition 34/35 for a 2012-2013 flight. During Expedition 35, he became the first Canadian to command the space station. Hadfield's early tweets from the space station in December caught the attention of fellow Canadian William Shatner, best known as James T. Kirk, captain of the U.S.S. Enterprise on "Star Trek." He also received public attention for his eloquent tweets showing the view from the station, and humorous videos. Besides which, Hadfield could play guitar — which he did often in orbit. Just before landing, Hadfield's swan song to space involved recording a new version of David Bowie's "Space Oddity" — which went viral. After 146 days on his last mission in space, Hadfield returned to Earth in May 2013 and quickly jumped into a new career of writing, public speaking, teaching and generally spreading the word about space. He still is a frequent commentator on space and occasionally makes guest appearances on shows that cover even unrelated topics, such as "Masterchef Canada."